Have you always dreamt of a place designed for you to enjoy your favorite past time or hobby? Why not build a craft cottage? Craft cottage plans are designed to give hobby enthusiasts a designated place for enjoying their favorite pastime whether it is woodworking, knitting, or even scrapbooking. Think of how great it would be to have all of your supplies and tools organized in your very own place. Countless enjoyable hours will be spent in your very own place like the ones you see in our collection. 2000 Sq. 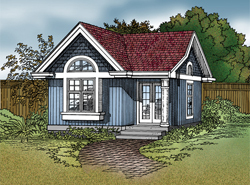 Ft., Width 65'-0", Depth 36'-0"
House Plans and More's collection of craft cottage plans includes many styles and sizes perfect for your dream craft room. We offer detailed drawings that allow the you to envision exactly how the finished space will look. With a wide variety of plans, we are sure that you will find the perfect do-it-yourself project to fit your needs and style.